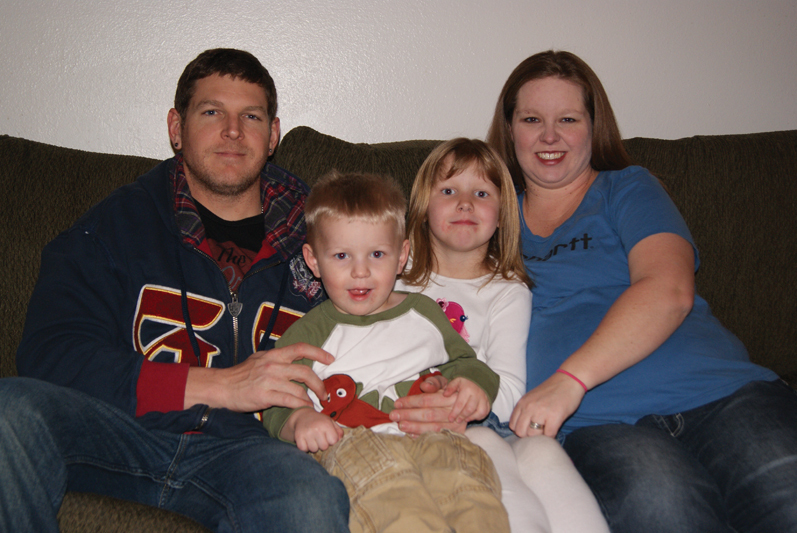 John Simonette, left, Jase Simonette, 2, Madison Simonette, 5 and Ashley Simonette sit together on their couch at home. Big sister Madison and Jace have both worked with speech therapist Mona Entwhistle from Horizons early intervention program. Madison Simonette, 5, runs circles around the Simonette family’s living room, with little brother, Jase, 2, in tow. Talking up a storm, you’d never guess Madison once worked with a Horizons Specialized Services speech therapist. Only saying mom, dad and hi by 18 months, Madison’s pediatrician recommended Ashley and John Simonette consider contacting Horizons and utilize their early intervention and family support programs. Working with children from birth until age 3, therapists help increase children’s motor, language and cognitive development through play. Working with speech therapist Mona Entwhistle, Madison now will talk your ear off; in fact her parents say they have to remind her to give Jase a chance to respond before answering for him. And now the Simonette’s are hoping Entwhistle can help Jase, too. John and Ashley said although Jase doesn’t speak very much, it’s not for a lack of comprehension. “His comprehension of things is amazing,” John said, adding that Jase follows basic instructions with ease. More than just a therapist, Ashley said the kids love when Entwhistle comes to visit, which she does every Monday to work with Jase, driving down from Clark to do so. John said he and Ashley are hoping the program does a lot for Jase, who really likes noises but not necessarily words. The Simonettes said Enthwistle helps them know how to work with Jase when she’s not there, as well, giving progress reports and things to work on during the week while she’s away. For those worried about their child’s development but hesitant to reach out for help, John and Ashley have a bit of advice. John said not accepting the help would be a poor decision. The early intervention program aims to help children before they reach school age, because the sooner the better to begin working on developmental issues. Horizons offers their intervention and family support programs at no cost to any family who needs them. That’s why this time of year, Horizons is having its annual Little Points of Light Fundraiser, to help continue provide valuable services like the ones for Madison and Jase at no cost to those who need them the most. The Moffat County Horizons office is located at 439 Breeze St., Suite No. 100 in Craig. Contributions may be mailed to P.O. Box 1483, or for more information call, 970-824-2643. “They’re extremely cooperative and extremely helpful,” Ashley said.